Early on in my kayak career I decided to add a fish finder. I did a little research, found one I could afford, and took it home. That’s where the problems started. A fish finder is typically mounted on the back of a power boat, or on a trolling motor. I had neither as an option. I was paddling a 10’ sit-in kayak with no power source, no holes drilled, and not a flat, even surface on the thing. I searched online, and figured out how to hook it up and mount the transducer inside the kayak. I wouldn’t get great temperature readings, but it should give me contours and depths - if I didn’t have any bubbles in the silicone. I took it out and apparently had bubbles. Crap. I got frustrated, took the fish finder out of the kayak, and sold it. When I got a little further along in my paddling lifestyle, I decided to try again. This time I talked to an actual kayak shop and found out about another option. The new way would allow me to remove the transducer and unit after each trip, and have no goop to deal with. Additionally, I’d get accurate temps and sounder readings because the transducer would be in the water. My favorite part of the whole thing was the name, because it fits so well. The swing arm that holds the transducer is called the “Liberator”. Perfect. A couple of different options are available when you go this route. I wanted a board to mount my fish finder unit to, as well as the swing arm (also called the Transducer Deployment Arm, or TDA). I fish in some thick weeds and grass, and wanted the option to flip the transducer up with my paddle (without having to loosen any screws or bolts) to avoid dragging it, and also to increase speed when paddling. The only permanent thing you’ll need is an 8” section of GearTrac from Yak Attack. Lots of kayaks already have it installed. If not, you can add it. The Liberator (TDA) is from a company called Mad Frog. They also make the “Slide Trax Board”. Both items combine to make the setup I have. If you already have a track installed on your kayak, you won’t even have to drill a hole. I’ve been using this setup for a little over two years. 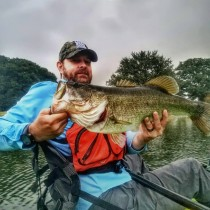 I love the fact that I can move it from kayak to kayak for fishing in different conditions - not having to buy a fish finder for each kayak - and the ease of swapping out in case of an upgrade. Where is th power source for your fish finder? Hopefully you'll see this and respond (as it's written some while back). I have a Pungo Angler and without a rudder I'm slightly sceptical to having the transducer on the side. Not many other places that I can put it without things becoming a hassle when getting in or out of the yak, but still. The fear is that it will make a constant drag to the side it's mounted, as well as perhaps being a bit in the way when paddling, though that's not the greatest concern. As the Pungo's equipped with a lot of RAM balls already I figured I'd go with the easiest option of purchasing the RAM transducer arm. Any thoughts on how it'll work? I use a similar setup because I have multiple kayaks and like to use my FF in all of them. You will notice a little drag especially when you are not actively paddling and just gliding along, but it isn't anything you can't account and adjust for. You should be able to mount if forward enough so it doesn't get in the way of your stroke. I love the simplicity of the design, so I decided to make a DIY version, using some square aluminum rod stock, a black HDPE cutting board, and some bolts, nuts and washers. I finished off the aluminum with some cheap truck bed liner. Way better than anything else I had come with to run my transducer, and dirt cheap.